Every wonder why people leave big tips? Bars are a big deal all around the world. I personally love them because they are literally everywhere. I have been to Shanghai, Japan, Australia and all through Europe. And every country has a local bar where everyone loves to visit. And depending on the culture most people leave bartenders with a decent-sized tip. You may wonder why that is. Here are a few reasons why people tip well when it comes to bartenders. Bartenders are notorious for being great listeners and they hear it all. Bartenders spend a good amount of their time making sure you are ok and listening to any problems you may have. Think of it as therapy session that costs way less and comes with booze. By the end of your time at the bar, you have spilled your guts out to this stranger. They kept your glass filled and offered you advice so the least you can do is leave them a generous tip. Bartenders have to juggle multiple tasks and know a lot of different things all at once. They must understand how to think on their feet and how to concoct thousands of delicious drinks. If you order more than one drink and all are different. It is going to take your bartender some skills to be able to measure and mix your drink properly in a timely manner. If the bar runs out of a certain ingredient, bartenders must know of similar drinks to create. They have to determine what you may enjoy or perhaps create something on their own. You should reward the bartender for thinking outside the box while tending to your needs through all the madness. When things get hectic, the bartender has to stay calm and focus in order to maintain control of the bar. Because of this, your drink could take longer especially if you are not a good tipper. Bartenders have to pay bills and the best way to do so is to reward loyal customers and ones who tip really well. Bartenders remember good tippers and watch out for you even if things become frantic. Not only will they keep an eye on you, they’ll tell the other bartenders to make sure they do the same. People like to be treated with VIP service. That's why people pay for first class or spend extra money to skip the line at the club. An extra tip here and there will get you faster service. Try it!! If you are a regular, you will get to know the bartenders and they will get to know you. Over time the bartenders tend to act like friends who help to protect you in certain situations. There have been a couple of times when I have visited my favorite pub and a few intoxicated people got too friendly and aggressive with me. The bartenders all knew me there and immediately diffused the situation. Suffice to say they all received a large tip that night as a show of my gratitude. You may tip a little more for some extra security. The holidays are an ideal time for big tips to happen. People feel overly generous and want to do something nice for someone. Large tips can be seen as charity and tipping a bartender more can be a quick way to do it. At times, people want to express a sense of satisfaction and leaving a nice tip feels just as good to you as the person who receives it. You spend a good amount of your time at the bar, and over time you get comfortable with the bartender. Leaving a big tip to the local bartender makes you feel like you are doing a good deed and helping out members of your community. People are often motivated to tip extra due to social pressures and wanting to be viewed as big-hearted. 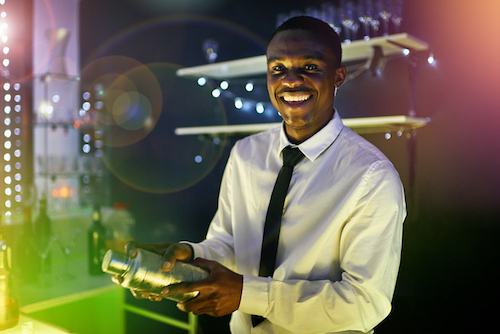 Bartenders work long hours and do it all with a smile on their face while providing the type of service that you don’t receive anywhere else. Good bartenders have a way of making you feel like things will be alright. For this reason many people leave big tips as a way of thanking bartenders for their commitment and service.